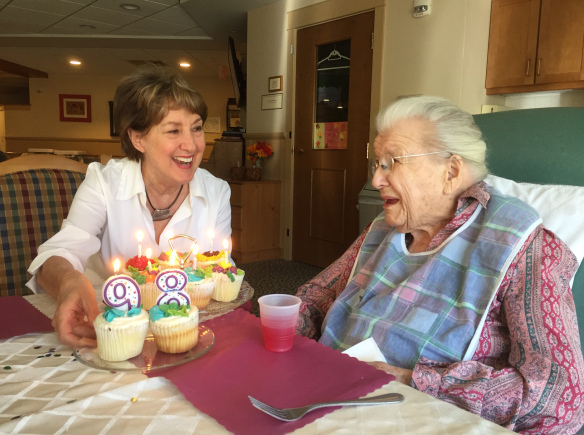 My Aunt Ruthie died at age 98 1/2, so she never reached 100, a goal I sensed she hoped for in her healthy years. But she did celebrate birthdays on October 4 every year before then. Some happily in elder days. The diary entries below report one birthday celebrated with a freezer full of ice cream, and sadly, one that no one appeared to remember. Oct. 1 Fri. & what shall we have in art? You’re asking me. Hectograph doesn’t work – so what…Do a little free hand stuff that is really most [of] the paper. Week nice after yesterday’s rain. Oct. 2 Sat. – Schoolboard Meeting which I attended once. 1stcheck $ 119. And some cents really should have been $ 140.00 But Income and Retirement Reduction left me the above. Didn’t expect to see Bo after election humiliation but he was there! Oct. 3 Sunday. & everything that goes with it. At Mt. Joy tonight to hear John Mummau. Had a good chat with Myra and Lois. 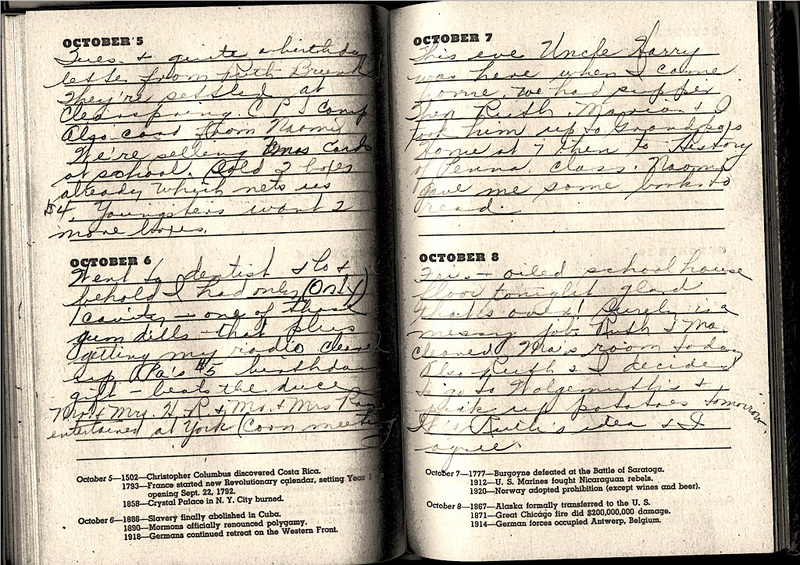 Oct. 5 Tues. & quite a birthday letter from Ruth Brunk [Stoltzfus]. They’re settled at Clearspring CPS camp. Also card from Naomi. We’re selling Xmas cards at school. Sold 2 boxes already which nets us $ 4. Youngsters want 2 more boxes. Oct. 6 Went to dentist & lo & behold I had only (ONLY) 1 cavity – one of those gum deals – that plus getting my radio cleanup. Pa’s $5 birthday gift – bears the duce Mr. & Mrs. H. R. & Mr. and Mrs. Ray entertained at York (corn meeting). Oct. 7 This eve Uncle Harry [Horst] was here when I came home. We had supper. Then Ruth, Marian & I took him up to Grandpa’s Home & then to History of Penna. Class. Naomi gave me some books to read. Oct. 8 Fri. – oiled school-house floor tonight glad that’s over! Surely is a messy job. Ruth & Ma cleaned Ma’s room today also Ruth & I decided to go to Wolgemuth’s & pick up potatoes tomorrow. It’s Ruth’s idea & I agree. Oct. 2 Mr. Eshlemen [supt?] was at school this afternoon & said that “things seem to be going nicely.” That’s sort of a nugget coming from him. It’s the 1sthe’s been here in 3 weeks I believe. I had a coughing fit that almost took me right after dinner. Up early & washed – ironed this even. Oct. 3 Rain today – flat tire when I wanted to go this A.M.colder – fire wood: all day. Jane fell f–t a desk & broke one of her front teeth! Ma & Anna Mae L. helped Mary clean today. Oct. 4 Yes, dear old diary, another birthday! & no one thought of it! Guess I’m past the “gift, party, cake” day. It was another dreary, cloudy, foggy day – that kind that makes you unhappy even if you want to be happy. Sent a fruit basket to Mildred Shenk today. The entries above reveal pale pencil marks. Cliff’s photoshopping has brought the indecipherable to life. Thank you! Did you, like Aunt Ruthie, have a birthday that no one remembered – or, remembered late? Historically, teachers have received low salaries. Most, however, don’t have to endure janitorial duties as Ruthie described in a two-room schoolhouse. What else stands out in her pages? Good morning! My computer is working right now (I cannot depend on it) so I get first bat. 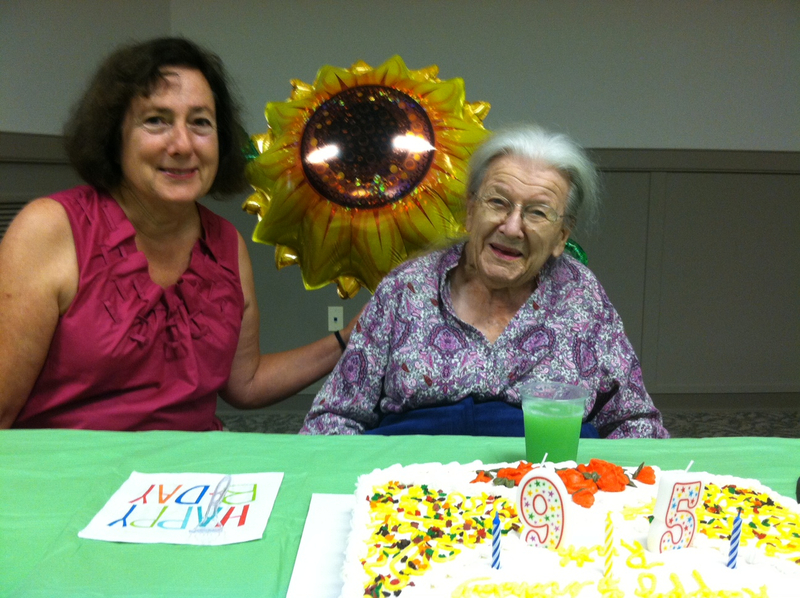 The reference here drew my attention: “quite a birthday letter from Ruth Brunk [Stoltzfus]. They’re settled at Clearspring CPS camp.” I considered her a mentor and encourager here in Harrisonburg and love this reference to her marriage to Grant and together at the CPS camp which she tells about in her memoir. If they were friends of the family I’m sure you’ve read that book too. She was not a close mentor, but occasionally we would get together. Mostly I admired her work and stature, physical and otherwise. Have a great day! Thanks for making this connection to the two Ruths. Melodie, There is more information about Clearspring and its workers at http://civilianpublicservice.org/camps/24/4 . See also Ruth Brunk Stolzfus with Eve MacMaster, ed. A Way was Opened: A Memoir. Scottdale, PA: Herald Press, 2003. Yes, thank you for supplying this link, Conrad! So much fascinating history. “Yes, dear old diary, another birthday! & no one thought of it! Guess I’m past the “gift, party, cake” day. It was another dreary, cloudy, foggy day – that kind that makes you unhappy even if you want to be happy.” This entry made me sad until I read on. I love how despite feeling low, she wanted to bring some joy into another person’s life by sending a fruit basket. She had a good heart. So far, no one has forgotten my birthday, but I suppose there’s still time. 🙂 I love these diary posts, Marian! Nothing like diary entries for direct dialogue. I guess I misspoke, my mother doesn’t remember my birthday, but thankfully my father is around to remind her. They are fortunate to have each other, and you are fortunate to have both parents alive. I know you are grateful, Jill! Good morning, Marian! How wonderful to have these diaries–and what a snazzy-covered box they were in. I am sure you are most thankful that Cliff’s work has made the entries readable now. That’s sad that no one remembered Ruthie’s birthday that year–though I imagine your parents were busy with a new baby. My mom doesn’t remember any of our birthdays anymore. You are probably right about the overlooked birthday. My sister Jan was only 5 days old and I suppose attention was diverted because of a newborn. My grandma was probably taking care of me and my mother, her new baby. Thanks, Jack . . . a bundle it is! Well, I’d say 98 1/2 years is not bad at all and it seems in good health for good measure. I should count myself very lucky if I reach 90. How lovely again for you to find these little family treasures. Shame about the forgotten birthday, unless they celebrated it afterwards, but nice to have a freezer full of ice-cream and the $5 gift in those days: it must have been quite a bit of money then. As for janitorial duties, I did help with the vacuuming of our school at the end of the summer term and bed making for the summer school students, a gesture that was very much appreciated by the maintenance staff. According to another commenter here, $5.00 back then equates to about $ 73.00, probably more in pounds or euros. Bless you for being a boon to the maintenance staff during summer term one year, which just reinforces what your readers know about your selfless nature. Thanks for popping in again here, Fatima! Wow! That is a generous gift indeed! Thank you for converting amount into today’s money. It wasn’t just one year I helped cleaning and making beds in school, but a regular thing almost till I left. Thank you for your kind words, though. Yes, it was generous. Actually, Cliff found the conversion scale and posted it earlier. Lovely post Marian and kudos to Cliff for bringing the faint alive. I feel a bit faint today, dealing with bills, tidying my study and so on but like Aunt Ruthie who had completed her task I’ll be glad when it’s over. Lovely photos too – a dear lady. Happy birthday, Aunt Ruthie. Thanks for your diary, hidden under that worldly box all these years. You have left a record of a faithful life, including the day no one remembered your birthday. There will come a time when no one remembers any of our birthdays. And the best thing we can do in the meantime is to think of who might need a fruit basket. Who might need a fruit basket? I can think of 2-3 who need one, or maybe just a card or phone call from me. When I read that Ruthie was given $5.00 on her birthday in 1943 I was curious to see what that would be worth in 2018. According to one Google calculation — $72.94. Hey, I wouldn’t mind if someone gave that amount to me on my birthday on January 9th. Hint, hint. Aunt Ruthie never really had the chance to get to grips with anti-social media or like me she could have made sure no-one forgot her birthday by sending out weekly updates about presents appreciated so people have plenty of time to confer about who gets what. No-ones ever bothered with the Rolls Royce or the Lamborghini yet. 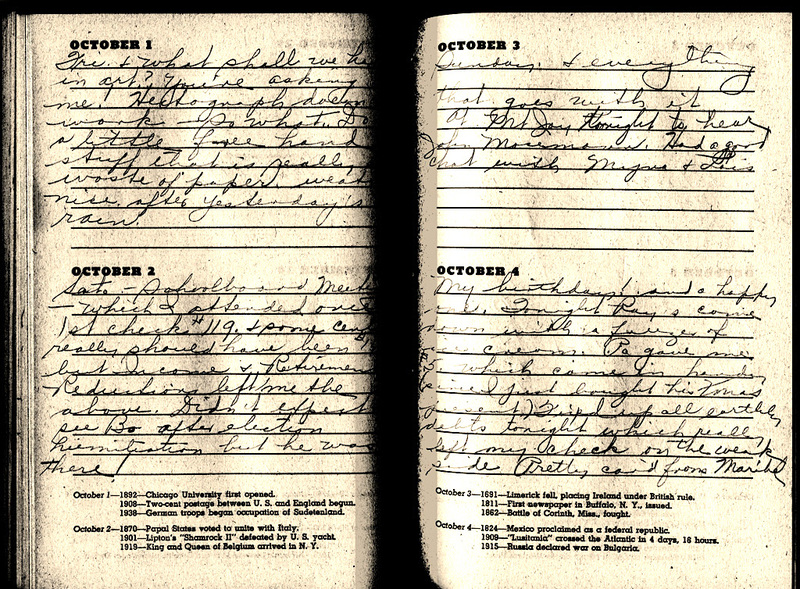 I love reading these diary entries of your dear aunt Ruthie. They are delightful and so real. Thanks for sharing. I recall thinking everyone had forgotten my birthday once and was so down about it. I think mom had planned something for the weekend. “So real” describes her entry to a tee. She lacked guile and pretense, which reinforces how authentic she remains in my mind. I’m glad your mom had something else up her sleeve when you thought she had forgotten your special day – ha! What a treasure that box of diaries is! I’m glad you put a link to Hectograph. I had no idea what that is! I love that her dad gave her $5 just in time for her to buy his Christmas gift. 😀 😁 This reminds me to be kinder to my Aunt Gladys. We email back and forth. Just before this post aired, it occurred to me that most readers may have no idea what a hectograph machine is or looked like, hence the link. I remember (faintly) the purple imprint on the gelatin “belt.” What Aunt Ruthie intended to do, probably, was run off coloring sheets of story book characters so the students could color while she read them a story. I remember that happening when I was in her classroom. Thanks, Marie! You really do have a treasure trove of family life. Happy Birthday to Aunt Ruthie! Aunt Ruthie was a delight. 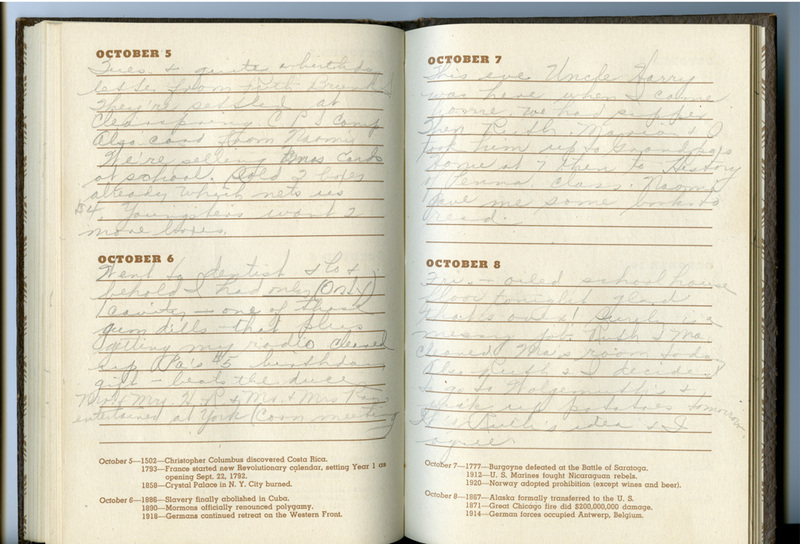 Her diary is so neat and tidy, like a woman who had it going on. I like the Seth Godin quote, too. The reality of it makes me happy. Aunt Ruthie has not idea how famous she has become through these digital pages. Yes, she “had it going on” and we benefitted from her attention because she was unmarried and had only one set of nieces and a nephew. Yes, happy too we have this connection, Ally! Each son has had a birthday party where only one kid showed up. Thankfully, they were younger and so excited to play that it didn’t bother them. This Mama still hurts though. Marian, you are so fortunate to have had a diarist in your family. What a treasure trove! I am a diarist. Not sure I’d want some descendant to go through them and publish my most intimate rhoughts. Maybe aunt Ruthie didn’t get personal. Aunt Ruthie did reveal human emotions. She admitted to being pleased, disappointed, embarrassed, and even angry, sometimes at herself. I understand from at least one Mennonite historian that women showing their true emotions is rare. About, keeping a diary. A few months ago, i read some diary entries from when I met Cliff. Some of what I wrote there has provided text for one of the later memoir chapters. But I can tell you I won’t publish every titillating detail. Ha! This was interesting. Although I don’t keep a diary, I wonder how many of our diaries today would be void of interactions with other people and full of our social media woes. Not enough likes on photos… not enough followers. Makes me think of how important friendships & community are. This diary is a great gift to your family; thanks for sharing. Yes, Andrew, I view it as a gift from a godly woman. I don’t keep a diary with details like I have in the past, but I do keep a gratitude book. Some days they sound like diary entries because problems I’m concerned with sneak in. Thanks for stopping by with a comment, Andrew. You are welcome any time! Marian — Aunt Ruthie was an observer of human nature. I like when she wrote: “Mr. Eshlemen [supt?] was at school this afternoon & said that “things seem to be going nicely.” That’s sort of a nugget coming from him.” This lets us know that she’d observed him enough to do a compare-and-contrast, and knew a “nugget” when she heard one. Lighting a candle for Aunt Ruthie. And for you, Marian, who keeps Aunt Ruthie speaking to us. And for one whose feast day Aunt Ruthie shares….St. Francis of Assisi. I can feel you and Autumn thinning the veil between those who came before as well as those who are still coming. Aunt Ruthie probably never knew she shared a birthday with the patron saint of living things. 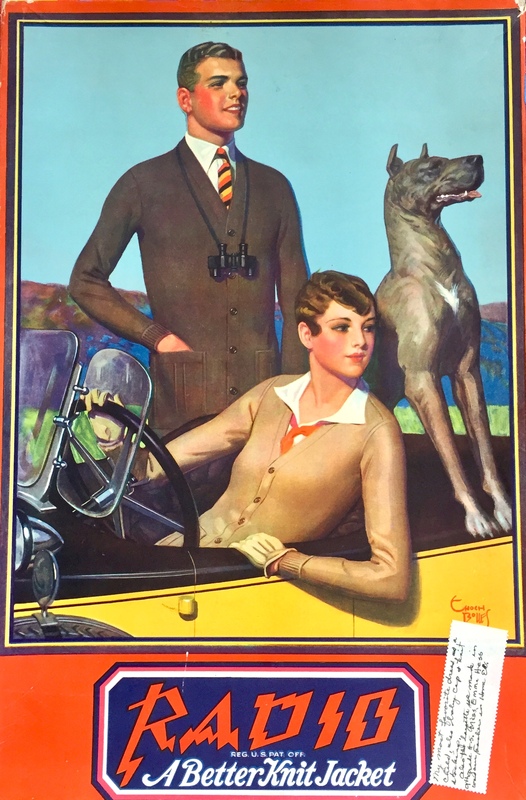 She, like he, loved God’s creation and animals especially. At her funeral service we sang, “For the Beauty of the Earth,” which my sister suggested ~ very fitting. Thank you for all of this, Dolores! No matter our age, no matter how long ago we lived, or how long we live, birthdays are an important marker in our life. As a child, I’d be devastated if my birthday was forgotten, and in truth, I would be as an adult too! 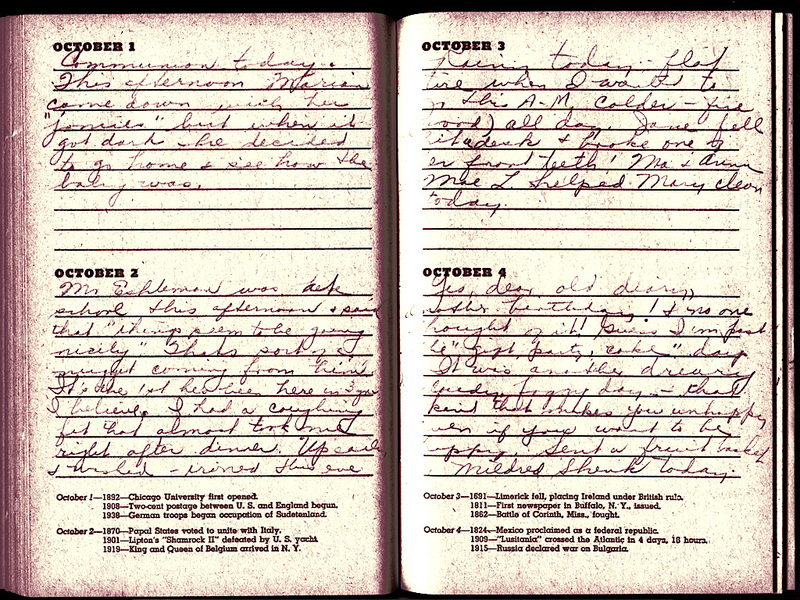 Love Aunt Ruthie’s diary and your sharing of it. You’re welcome, Pam! This week we have 4 Beaman birthdays with an age range of 11 – 77. I’m sure Cliff’s brother’s is as special to him as is our youngest grandchild’s. These days Facebook makes it all but impossible to forget birthdays. I love reading all those old entries! Thanks for sharing with us. A painted cedar chest!!? It must’ve a generational thing, painting over beautiful wood. My grandmother did the same thing in the ‘20s and ‘30s. Happy Birthday, Aunt Ruthie. Think how many people know it’s her birthday today, thanks to you, Marian. Thank you, Marian. Aunt Ruthie and Krista Tippet are wise. My birthday diary would be sparse in recent years because I’ve chosen to skip festivities and spend a day alone or volunteering somewhere. That’s another way to celebrate this life. Biggest deal is FB messages which bring a sense of connection to all those like-minded people I never meet. My mother-in-law reached 102+, as you know. I created a big celebration on her 100th birthday and she walked in with the help of a walker and the arm of a gentleman who lived in her residence. It was all downhill from there. Aunt Ruthie’s ice cream and gift from Pa sounded the best. That Pa was there. That $5 meant something. That life was sweet and there was a celebration for Aunt Ruthie’s special day..
We connect on our blogs and Facebook mostly, where my heart leaps up as I see you engage with those monarchs. Wonderful! Lovely to read about your lovely family . Birthdays hey ! We all get good and bad . I suppose you could say it’s what we make them but I think that’s the key …we try to make too much of them and then we can get disappointed. My favourite birthday was when I was eight maybe nine …newly decorated bedroom in bright orange ( fave colour of the time ) bright sunshine , daffodils everywhere and a baby angel ( much wanted doll at the time ) with golden hair for my birthday …perfect ! This really is a small, connected world (with or without the Internet, but especially with)! 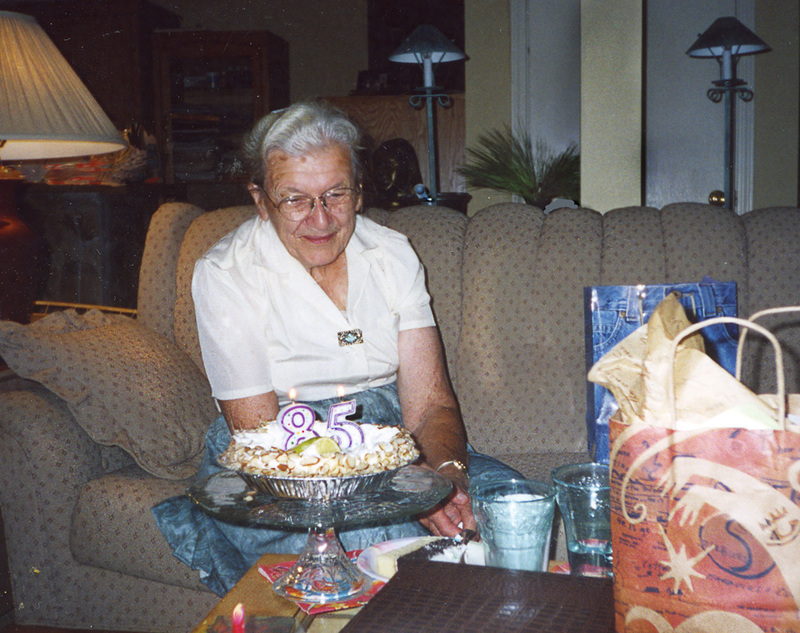 Your description of Aunt Ruthie reminded me of my grandma, who also passed away at age 98 but had aspirations of 100. Her diary references to Naomi (my grandma’s name) gave me a little shiver of recognition. Thanks for doing your part to keep all these connections strong! And thank you, for your input today, Rebecca! I’m happy for our connection here and for the family relationships this post inspired in your own. Ruthie had many girl friends from church and college. Now I wish I would have asked her their last names. Too late . . but maybe I’ll discover them in other diary entries.